If you ask me about the best way to explore the United States, I won't hesitate to say a road trip. Road tripping is by far the best way to experience everything that America has to offer. 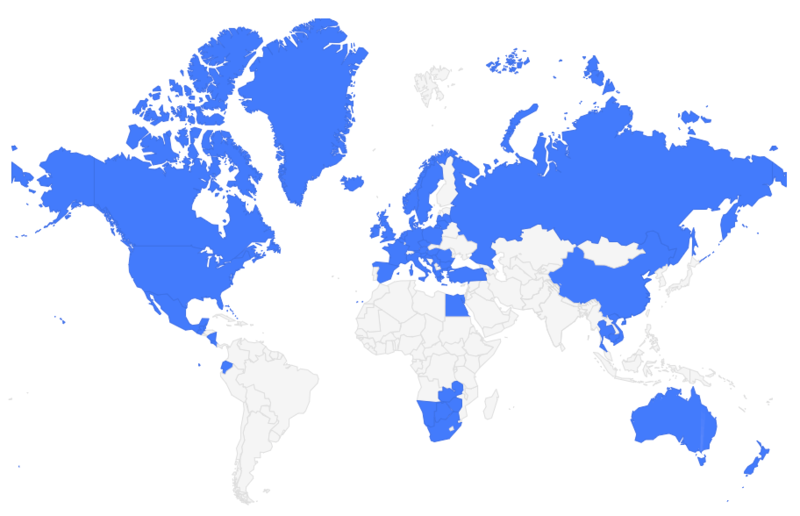 But, with the U.S. being such a huge country, deciding *where* to road trip can be tough. Should you tackle New England and the East Coast? The Deep South? The Pacific Northwest and California coast? Old Route 66? There are tons of great road trip routes in the U.S. But my favorite part of the country for a short(er) road trip is definitely the American Southwest. You have deserts and mountains and some of the coolest national parks in the country. We decided to begin and end our Southwest road trip in Las Vegas. You could also start in Salt Lake City, Utah, but I find that you can almost always find affordable flights to Vegas, no matter where you're coming from. So Vegas it was! And then we were out of Vegas! If you've never been to Las Vegas before, you could definitely add on an extra day or two in order to fully experience it, but we were itching to get to Utah. 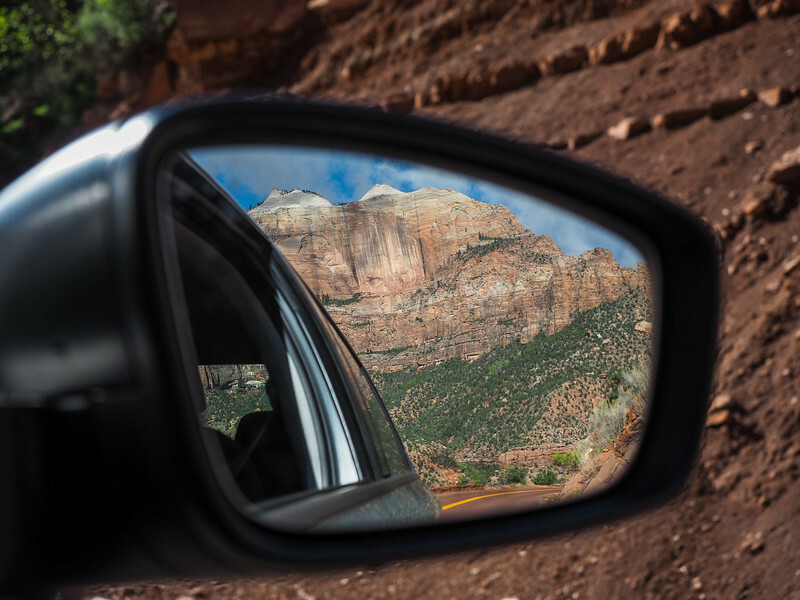 The drive from Vegas to Zion National Park in Utah takes just about 2.5 hours. 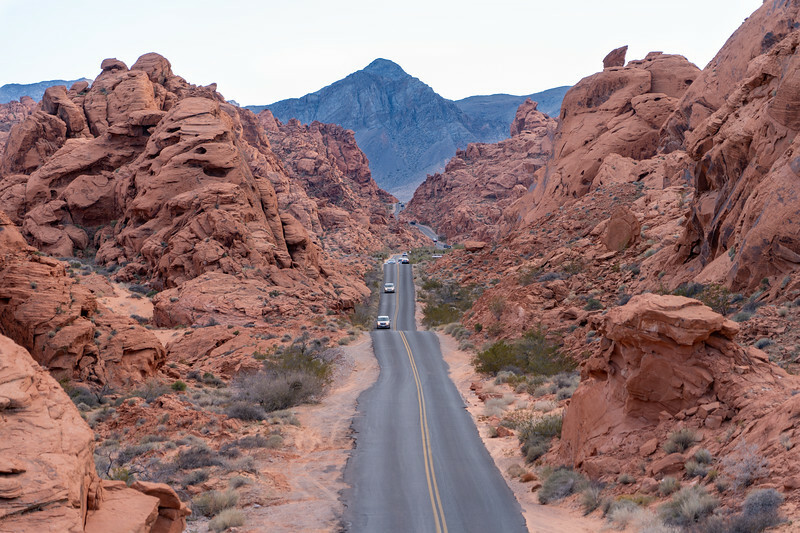 You could make straight for Zion, or you could make a brief detour to Valley of Fire State Park. Valley of Fire is just off I-15 (which you'll be driving on anyway), and is an incredible park filled with red rock formations. Fun fact: It was Nevada's very first state park. Even if you just have an hour or two, you can drive the epic White Domes Road and hike out to the Fire Wave – it makes for an excellent introduction to the Southwest. Valley of Fire is an hour outside of Vegas, and Zion National Park is another 2 hours beyond that. 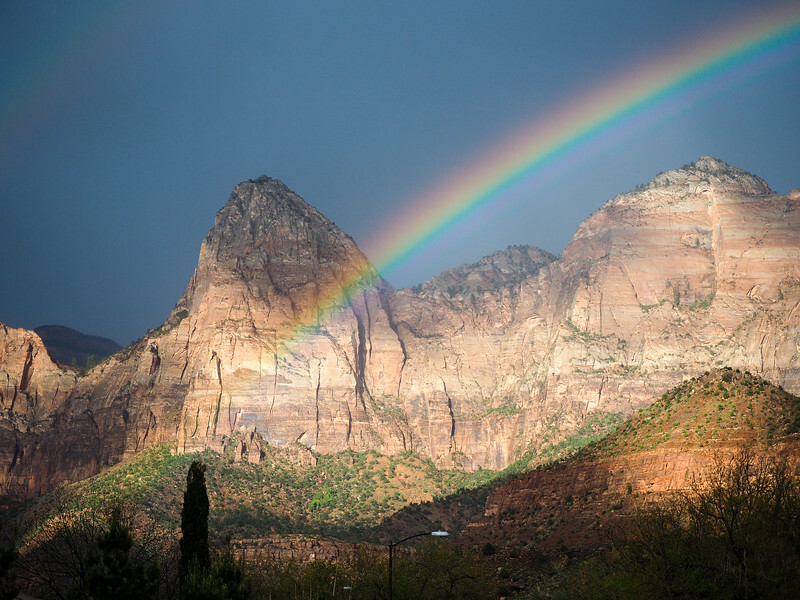 Some people will opt to stay in St. George (closer to Vegas) as a base for Zion, but we decided the small town of Springdale would be much more central and better for entering the park early on Day 2. 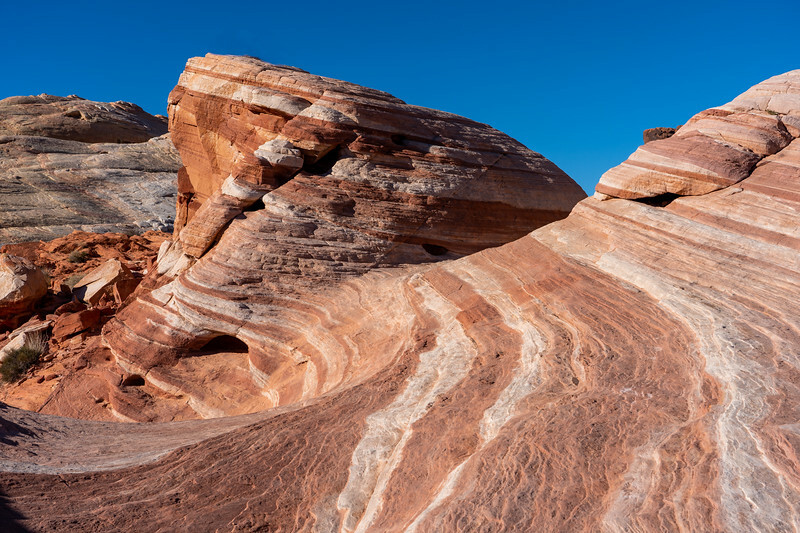 If you skip Valley of Fire, you could visit Zion in the afternoon/early evening tonight. Or, do what we did and explore Springdale a bit before getting an early night to prep for hiking Zion on Day 2! Where to eat: We hit up Oscar's Cafe (within walking distance from our hotel) for delicious burritos. NOTE: You absolutely will want to get yourself a for this trip. They cost $80 and are good for one year (you can , or at the first National Park site you visit). You'll save lots of money on this trip (potentially more than $100!) if you have one! 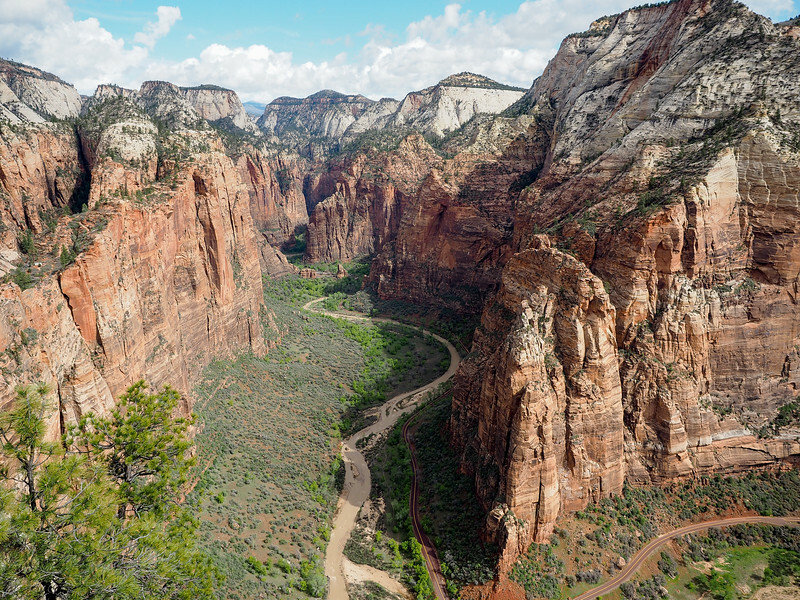 Wake up early to catch the free shuttle into Zion National Park, the first of the Mighty 5 parks you'll visit on this road trip. 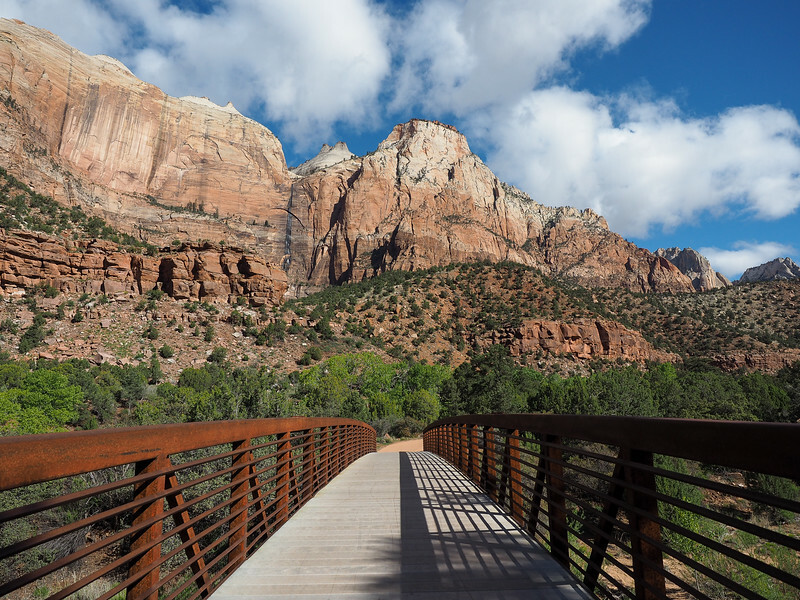 From March through early autumn, no private vehicles are allowed to use the Zion Canyon Scenic Drive, so you'll need to pick up another shuttle at the Visitors Center in order to head further into the park. What you decide to do with your day really depends on your interests, the makeup of your group, and whether or not you're up for any intense hiking or not. To see views like this, you'll need to hike! Elliot and I tackled Angels Landing early in the morning, which is a 5.4-mile hike that includes a 1500-foot elevation gain and half a mile of using anchored chains to pull yourself up along a narrow spine of rock. It's NOT an easy hike, but is one of the most iconic in the Southwest – and we didn't regret doing it. 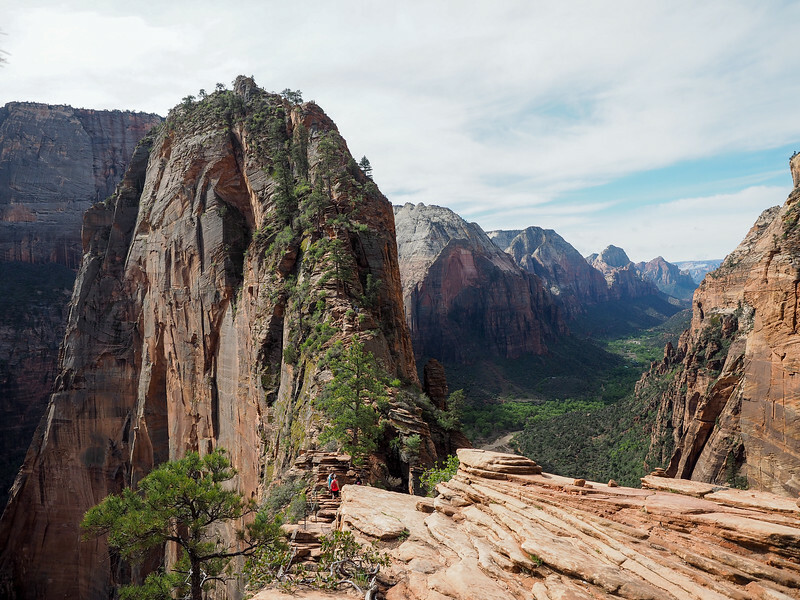 Halfway through the Angels Landing hike – it's epic! Angels Landing took us about 4 hours to complete, meaning we had time in the afternoon to ride the shuttle around the rest of the park and do a shorter hike (we chose the easy Lower Emerald Pool Trail that starts at Zion Lodge) before having a relaxing evening in Springdale. 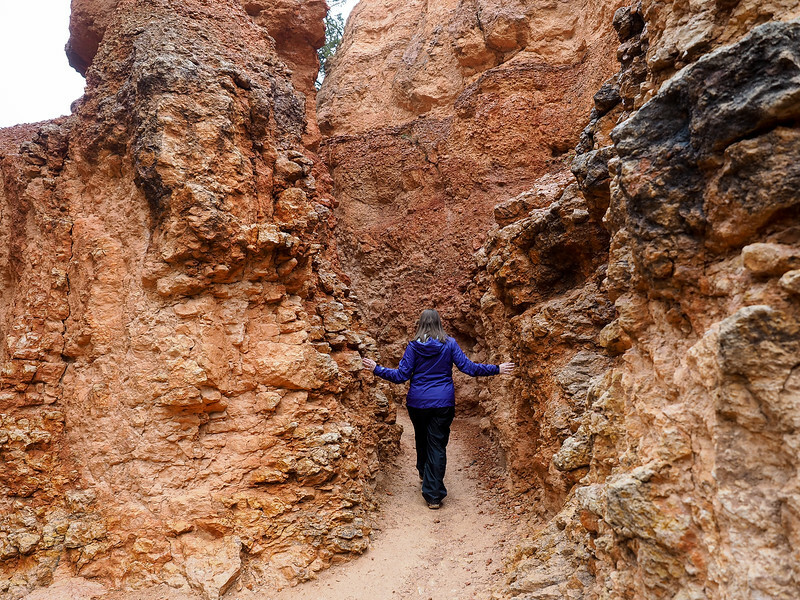 If you decide to do The Narrows, the hike will take you just about all day. 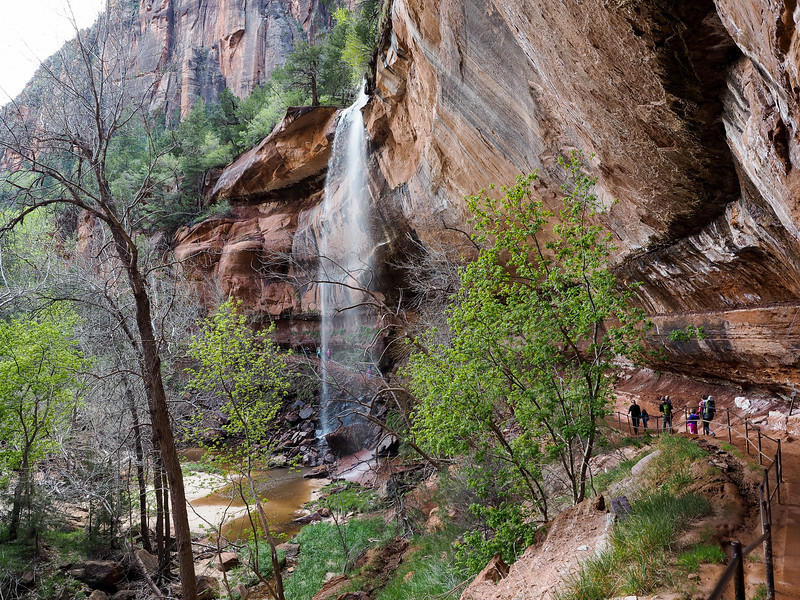 If, on the other hand, you decide the strenuous hikes aren't really for you, check out the easy and moderate hikes on Zion's . There are plenty to choose from that range anywhere from 30 minutes to 5 hours to complete, all with great Zion views. The Pa'rus Trail is a nice easy option. Where to stay: We once again stayed at La Quinta Inn & Suites at Zion Park/Springdale. Where to eat: After a day of hiking, we rewarded ourselves with pizza at Zion Pizza & Noodle Co.
Head out of Zion on Day 3 via the Mount Carmel Highway (the stretch of Route 9 between Zion's entrance and Highway 89) that includes some great scenery and a 1.1-mile-long tunnel. Keep an eye out for bighorn sheep (but if you're going to pull over for photos, make sure you do it at designated pull-out spots!). The drive from Zion to Bryce Canyon National Park only takes about 1 hour and 20 minutes, meaning you'll have plenty of time for photo stops and no need to rush. 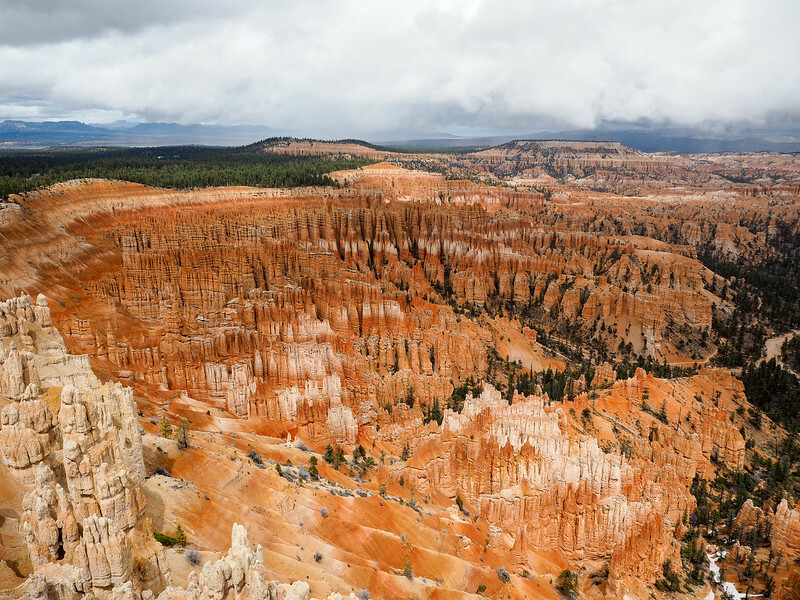 Once you get to Bryce Canyon, head straight into the park for some sightseeing! 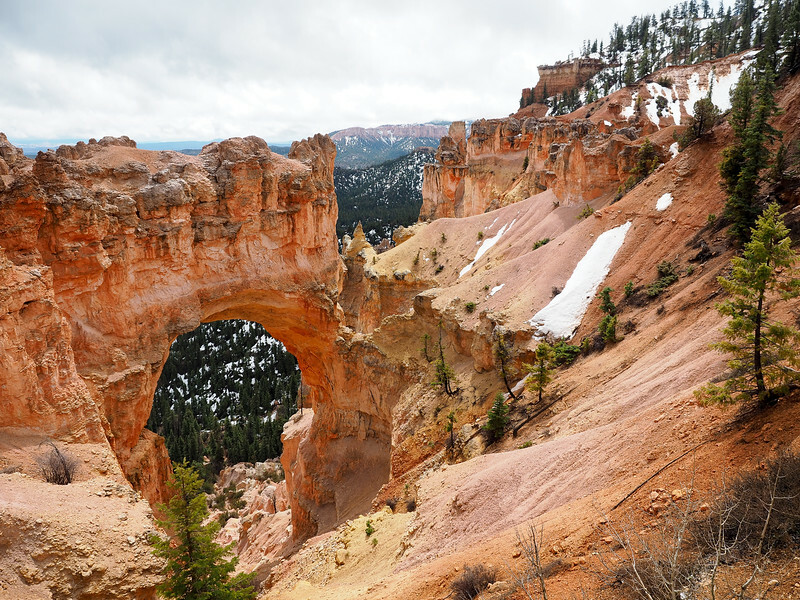 Bryce Canyon has some nice hiking trails, too, though it's better known for its 18 mile scenic drive and lookout points like Inspiration Point, Natural Bridge, and Rainbow Point. I recommend driving all the way out to Rainbow Point first, and then working your way back to the park entrance, stopping at all the viewpoints along the way. When you get to Sunset Point, take the 1-mile rim trail to Sunrise Point for some of my favorite views. Where to stay: There are very few options when it comes to hotels right near the entrance to Bryce Canyon National Park. We stayed at the Best Western PLUS Bryce Canyon Grand Hotel ( | Book here), though Ruby’s Inn right across the street is also popular. Where to eat: We visited Bryce in April, which is still more or less off-season in this part of Utah. Because of that, many things were still closed for the winter. We ended up having dinner at Ruby's Inn (they have a decent buffet) and picking up some snacks at their general store since nothing else was open. 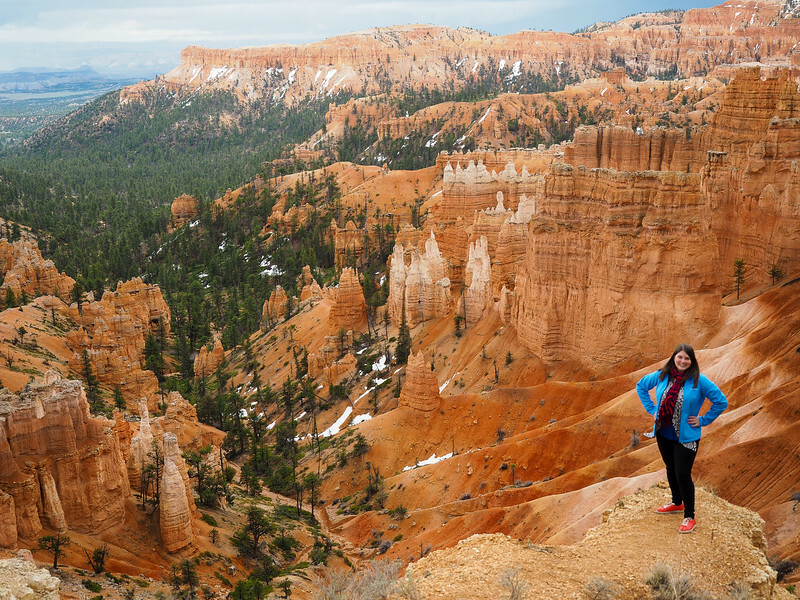 We took Day 3 off from hiking, but there's one hike definitely worth doing at Bryce Canyon: the Navajo Loop Trail. 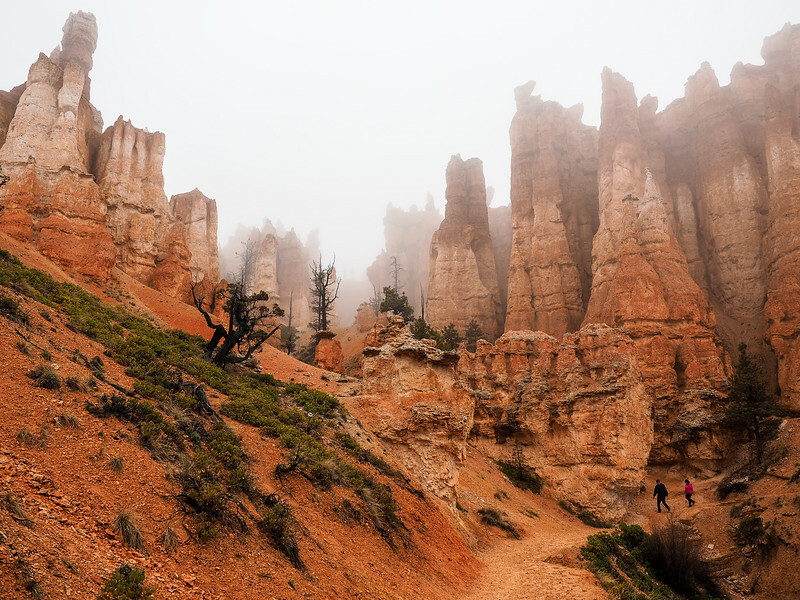 This trail will take you down into the canyon, right among all the orange hoodoos. The hike starts at Sunset Point, and can be joined up with the Queen's Garden Tail to end at Sunrise Point. We tackled this hike on a foggy, wet morning, and it took us about 2 hours to complete. It makes a great morning hike before you set off on the road again, though you could probably do it on Day 3, too, if you're not too sore after Zion. After our hike, we packed up all our things and headed further east. Our destination for the night was Moab, but we made a detour on the way to Goblin Valley State Park. 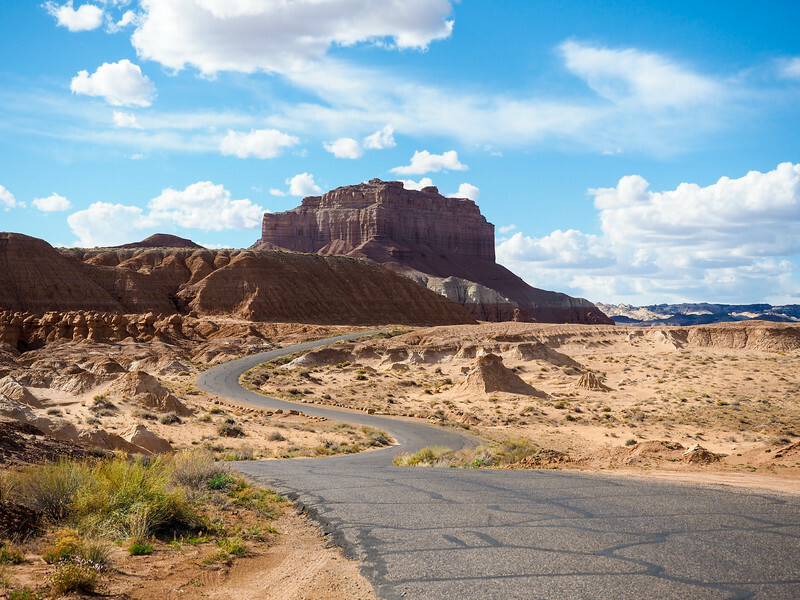 There are two ways to get from Bryce Canyon to Goblin Valley, but we opted to take Route 12, which takes you through Escalante and meets up with Route 24 so you can briefly drive through Capitol Reef National Park. 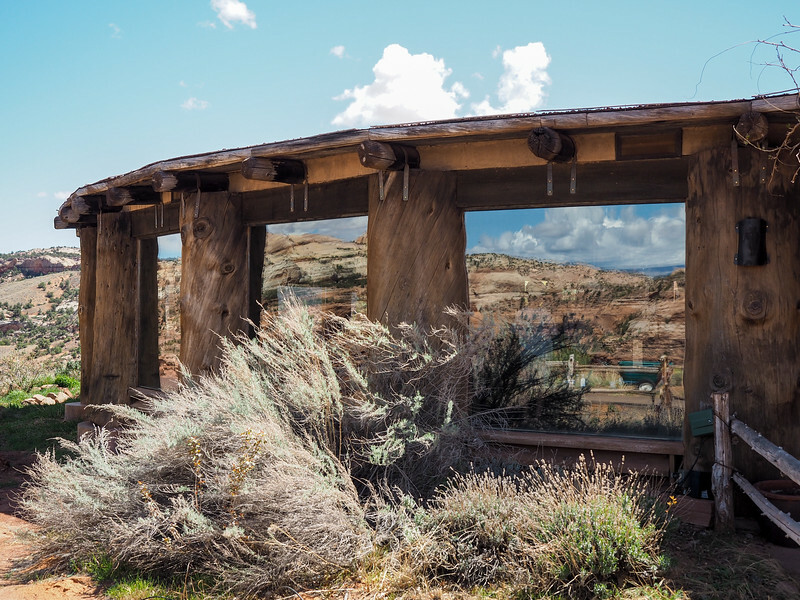 On the way, consider stopping for lunch at , which is a super cool cafe within Escalante Grand Staircase National Monument (about 1.5 hours from Bryce). They serve up homemade soups, breads, and pastries, and also have a full espresso bar – a perfect lunch break amid some typical Utah scenery. You *could* spend some time in Capitol Reef National Park, but we opted to go to Goblin Valley instead since it's a place far fewer people seem to know about. We got to Goblin Valley in the afternoon, and spent an hour or so exploring The Valley of Goblins. 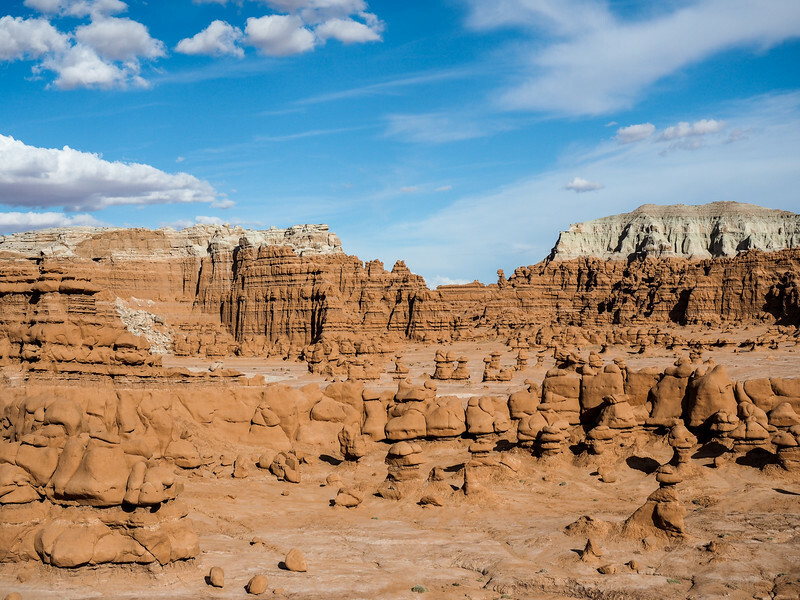 This is a large area filled with short, squat hoodoos that have been dubbed “goblins.” Even through Bryce is also known for its hoodoos, the ones in Goblin Valley are entirely different. From Goblin Valley, it's another hour and a half to Moab, where you can base yourself for the next couple of nights. Where to stay: Elliot and I stayed in in Moab (get a ! ), but there are also plenty of hotels and motels in town (along with lots of restaurants) to choose from. Check out the La Quinta Inn and Suites Moab, or the Holiday Inn Express Moab. Where to eat: We grabbed dinner at Moab Brewery, touted as the town's largest restaurant and only microbrewery. They have a bunch of beers to choose from (mostly ales and IPAs), and even brew their own root beer in-house. Canyonlands National Park tends to get overlooked by visitors to this part of Utah because Arches is also so close to Moab. But I firmly believe you should dedicate a full day to each park. 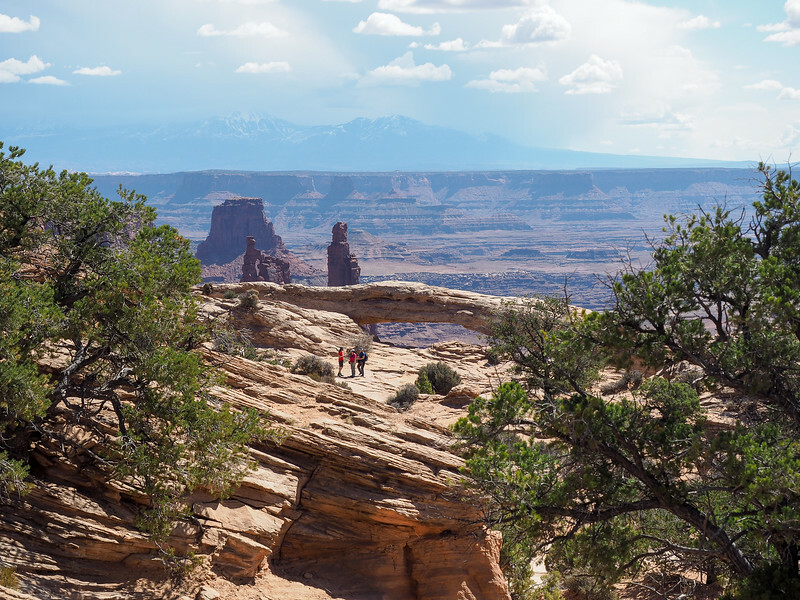 Canyonlands actually has two main sections of park – Island in the Sky and The Needles – which are about 60 miles apart. The Needles is more suited to hikers, so I recommend spending your day at Island in the Sky to mix in sightseeing with a little hiking. This section of Canyonlands is only about 45 minutes from Moab. Start out your morning with a visit to Mesa Arch. Many photographers will get here before sunrise in order to watch the arch be lit by the first orange glow of morning, but it's much less crowded if you visit slightly later in the day. Mesa Arch around 10:30 a.m.
From there, drive to the viewpoints at Grand View Point and the Green River Overlook. Elliot and I also did the short hike out to Upheaval Dome. 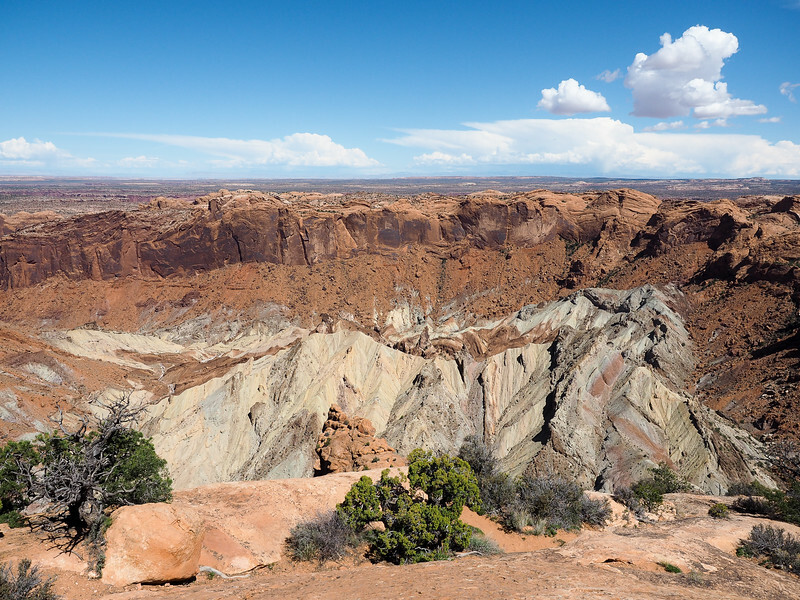 Upheaval Dome – scientists still aren't 100% sure how this was formed! 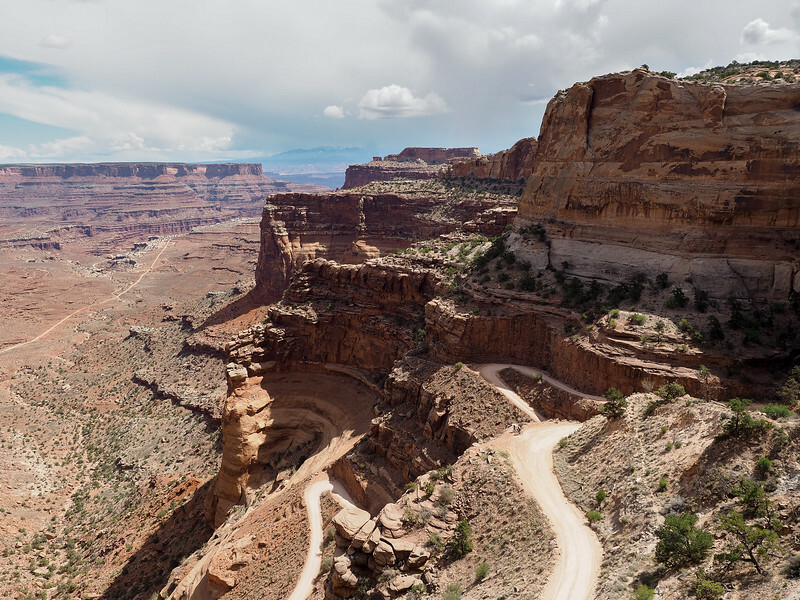 On your way back to Moab, be sure to stop at Dead Horse Point State Park, which offers up dramatic overlooks of the Colorado River and Canyonlands National Park. Where to stay: Check out the , or the . Where to eat: We grabbed some delicious wood-fired brick oven pizza from Zax Restaurant & Watering Hole in Moab. 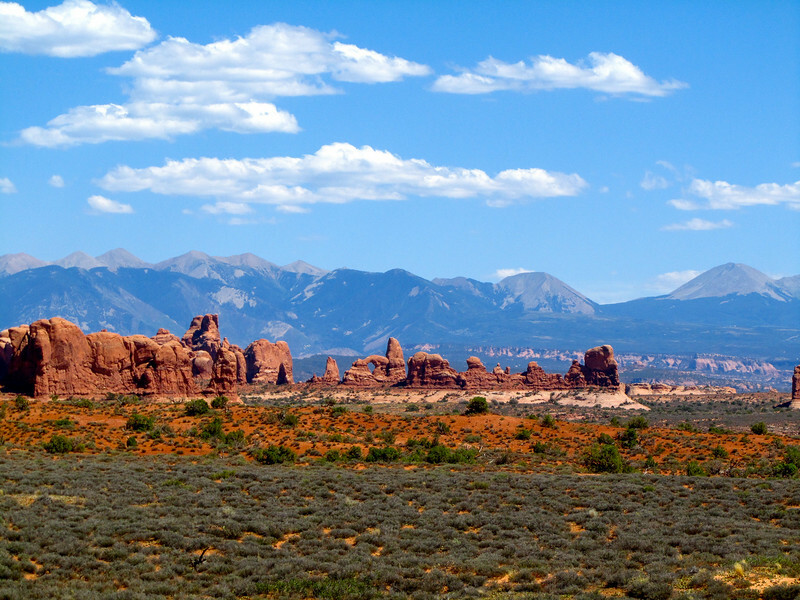 Located even closer to Moab (only 15 minutes from town), Arches National Park is really the star in this part of Utah. And for good reason: the park has more than 2,000 natural stone arches, along with pinnacles, cliffs, and balanced rocks all in a brilliant orange-red hue. 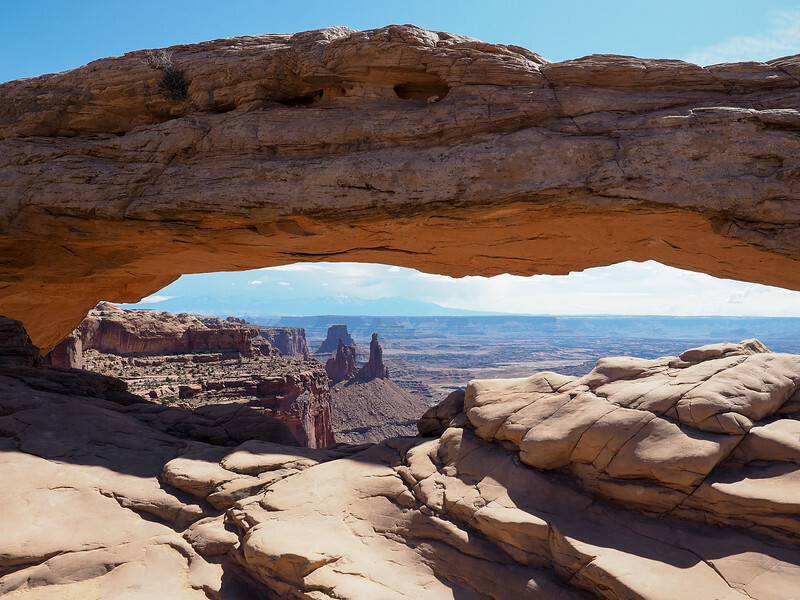 If you've never been before, definitely spend the first half of your day driving the 18-mile-long scenic road through the park, stopping off at some of the viewpoints and shorter walks out to the arches. Park Avenue, Balanced Rock, the Windows Section, and Double Arch would be my top picks. 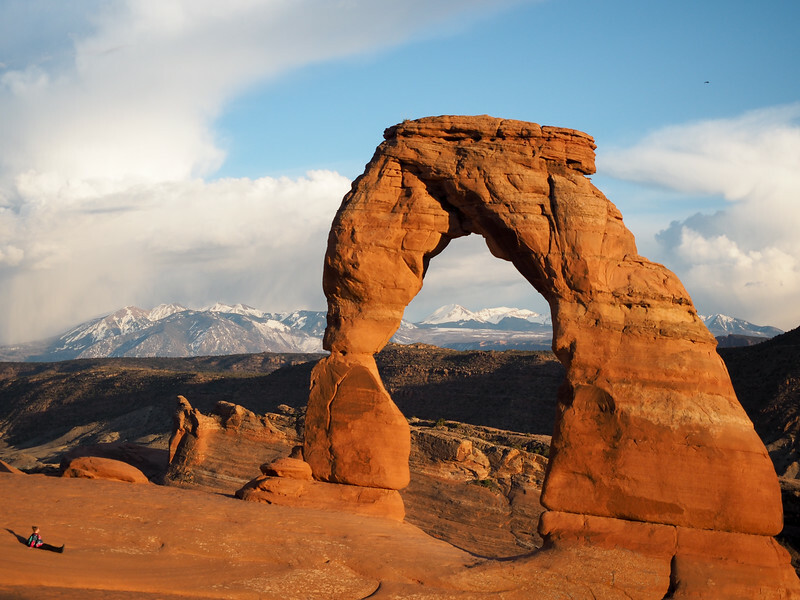 The most iconic hike at Arches National Park is the hike to Delicate Arch, the most famous arch in the park and the symbol of the state of Utah. Most people tackle this hike at sunset, when the setting sun paints the 65-foot arch an incredible rusty orange color. Look how huge Delicate Arch is!! 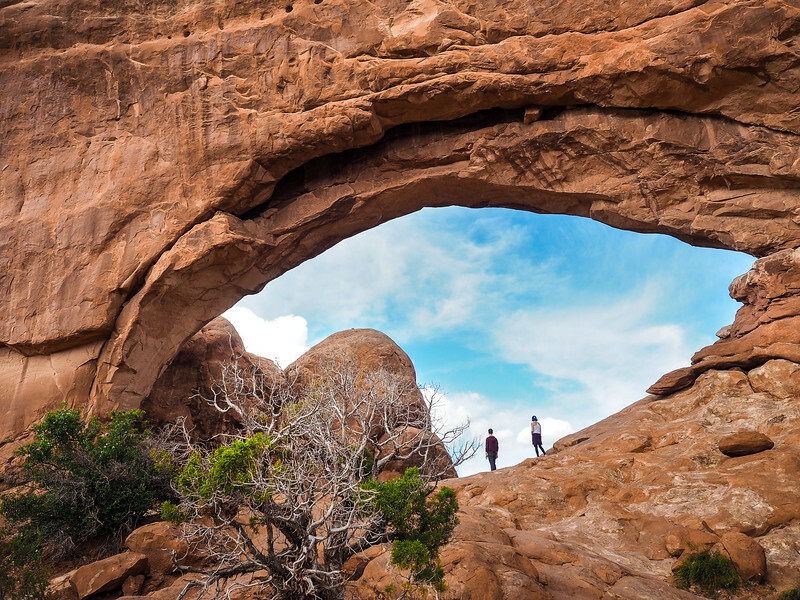 The hike is tough going up, so allow yourself 1-1.5 hours to reach the arch in time for sunset. We got there about an hour early and enjoyed a little picnic as we watched the sun go down. Where to stay: Again, Elliot and I stayed in in Moab, but you can also check out the La Quinta Inn and Suites Moab, or the Holiday Inn Express Moab. Where to eat: We loved breakfast at Peace Tree Juice Cafe, and got our picnic sandwiches from Sweet Cravings Bakery & Bistro. After nearly a week of exploring Utah's national parks, it's time to wave goodbye on Day 7. 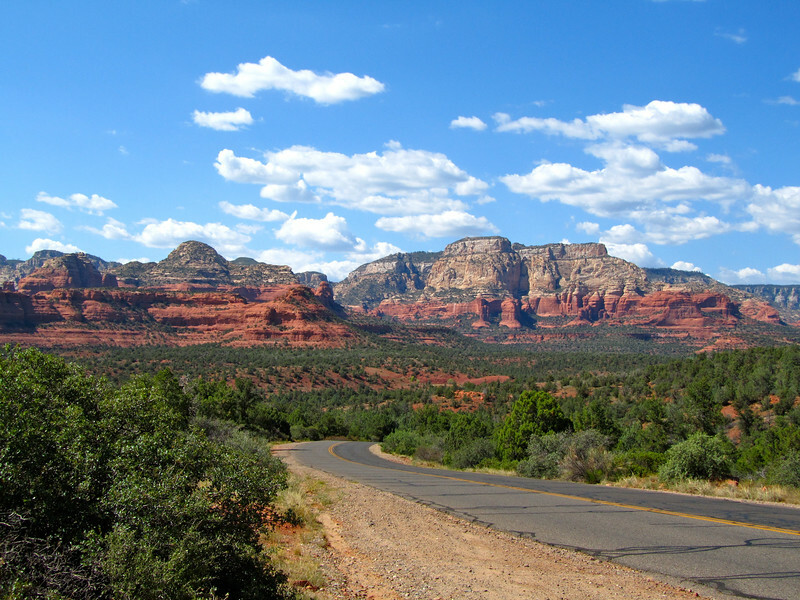 Today you'll be crossing over into Arizona – but the great scenery will only continue! 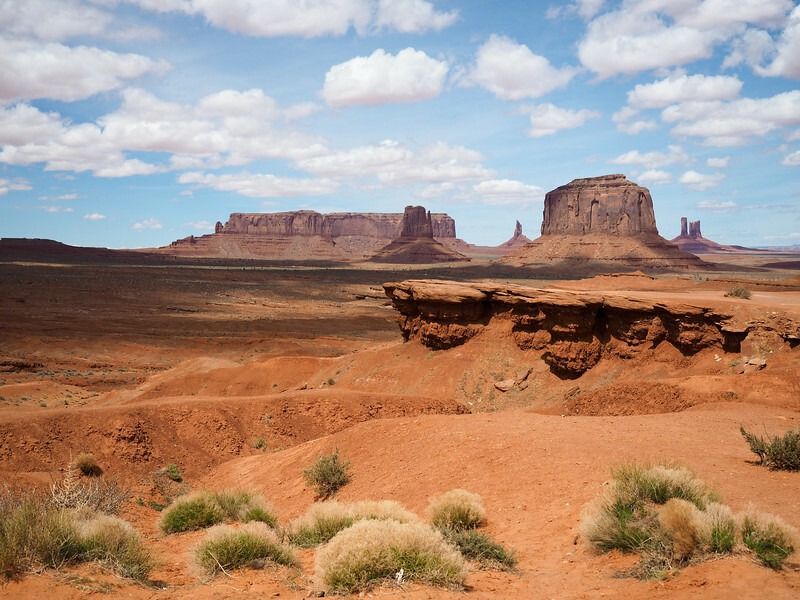 Your destination today will be the town of Page, Arizona, but I would be a terrible travel blogger and awful Southwest superfan if I didn't insist that you stop at Monument Valley along the way. 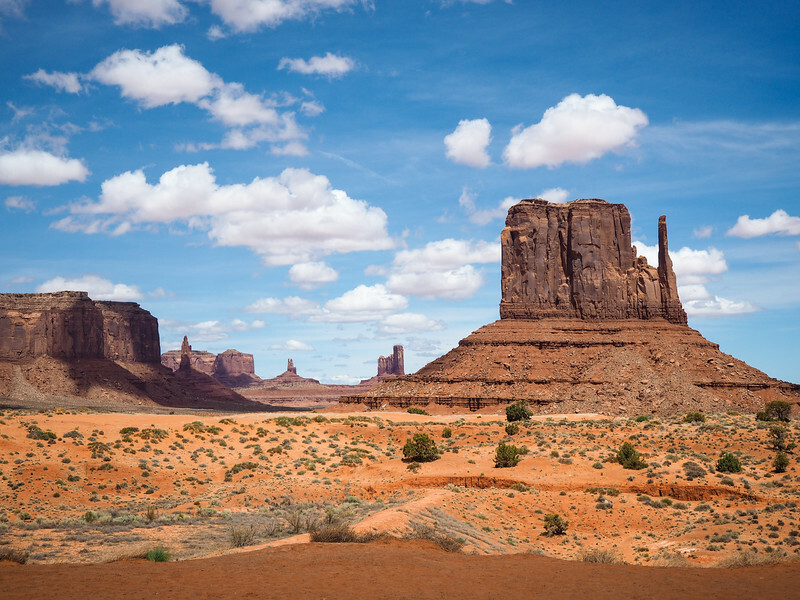 Located on the Utah/Arizona border, Monument Valley is a Navajo Tribal Park renowned for its towering sandstone buttes. 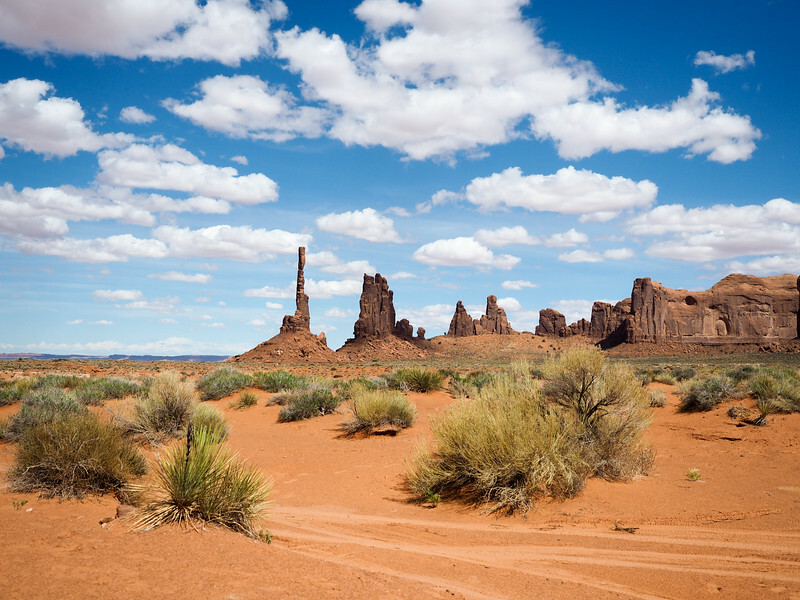 You may even recognize it from old Western movies, since it was a favorite filming location for directors like John Ford. This is actually called John Ford Point. Elliot and I arrived at Monument Valley before lunchtime (it's only a 2.5-hour drive from Moab), and took in the views from The View hotel before meeting up with our tour guide from for a guided tour of the valley. Where's Khaleesi to hatch these Dragon Eggs? You absolutely CAN explore the 17-mile Valley Drive in your own vehicle, but if you really want to learn about the park and see some of the backcountry (which is not accessible to normal visitors), you'll need to book a guided tour. Totem Pole, which you'll see on a backcountry tour of Monument Valley. After our tour was over, we drove the remaining two hours to Page to arrive just around dinnertime. Where to stay: We stayed at the Best Western View of Lake Powell Hotel, which has a really cool view from the pool. The and are also highly rated – but note that hotels in Page sell out extremely quickly during the high season, so this is one place where you definitely want to book as far in advance as possible. Where to eat: Definitely go get yourself a sampler plate at Big John's Texas BBQ in Page! Page is a tiny little town that packs a big punch. 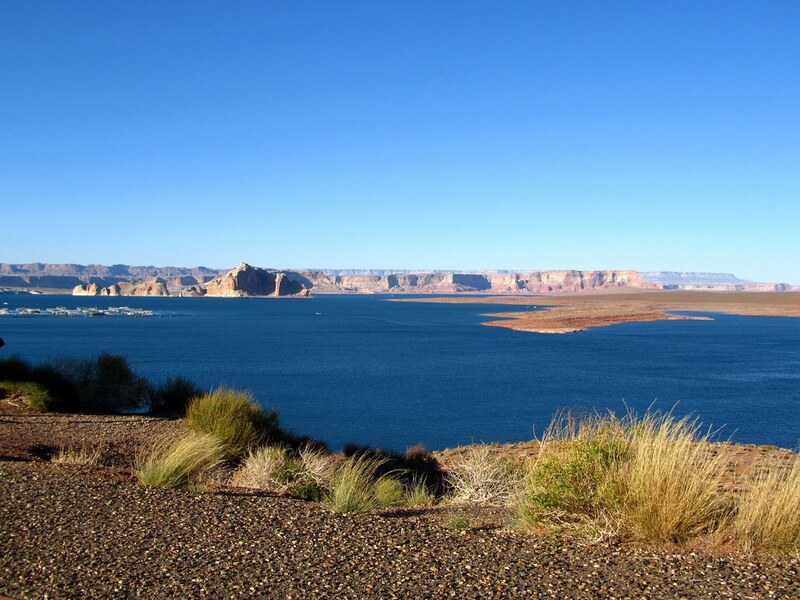 Not only is it near Lake Powell and the Glen Canyon National Recreation Area, but it's also just a short drive from Horseshoe Bend and Antelope Canyon. 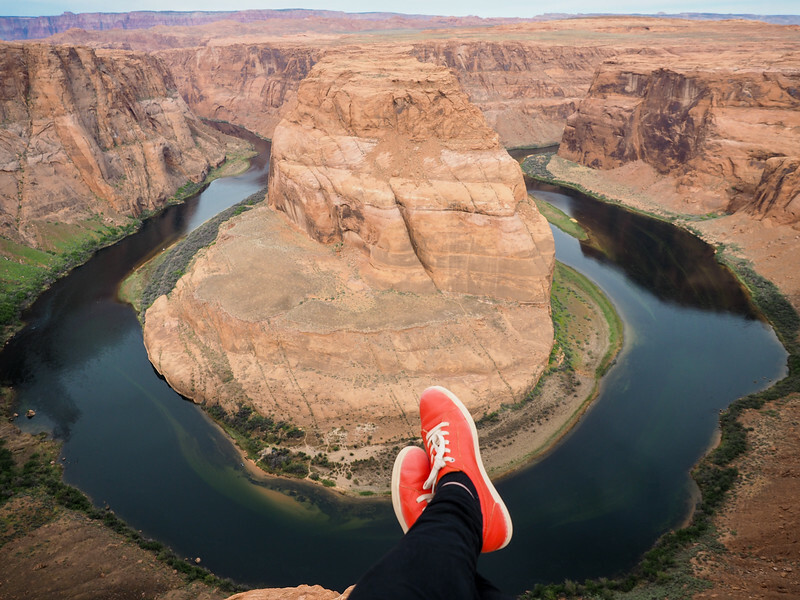 Start your morning off with a visit to Horseshoe Bend. It's just a 10- or 15-minute drive from your hotel, and is one of the most Instagrammable places you're likely to visit in the Southwest. 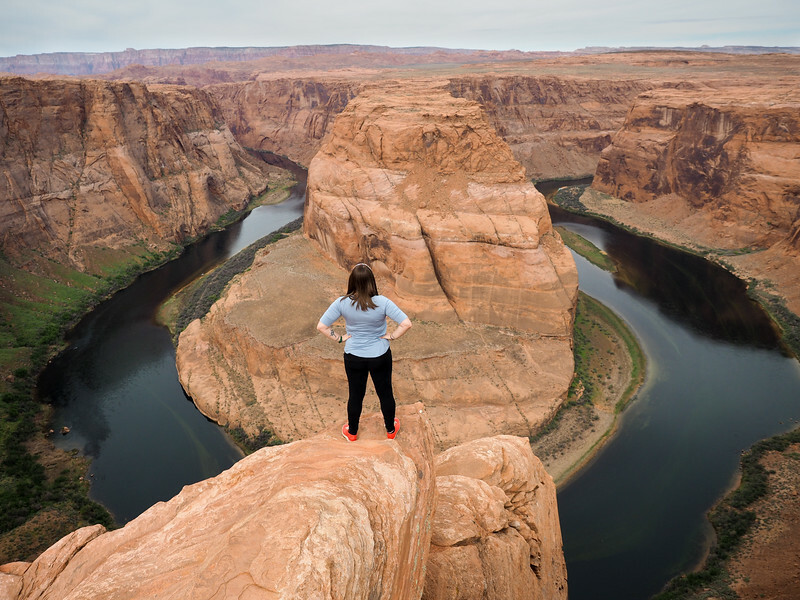 A short hike will take you from the parking area to an overlook 1,100 feet above where the Colorado River makes a massive bend through a deep canyon. The hike to the lookout isn't long (only about 3/4 of a mile), but it's almost entirely sand, so keep that in mind when you're planning your time AND your footwear. These shoes are not the best for hiking in sand! 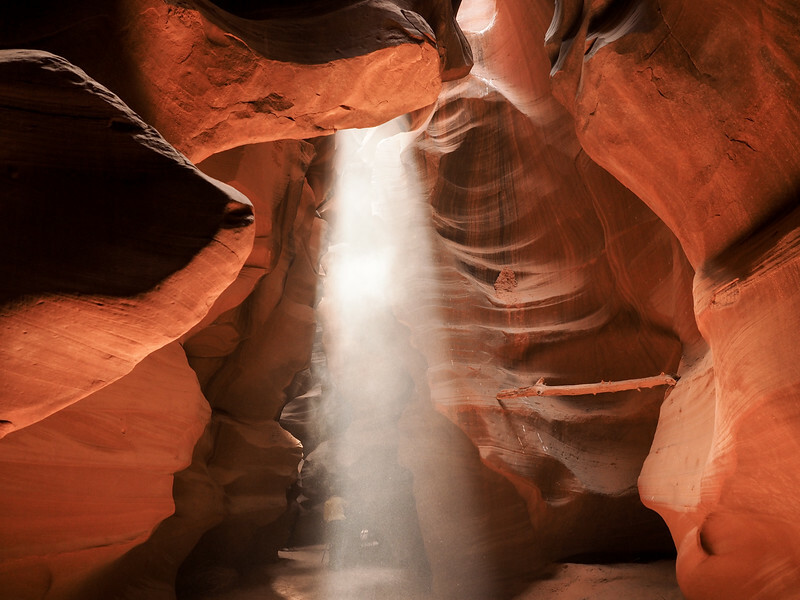 Before lunchtime, I recommend booking a tour out to Upper Antelope Canyon. Antelope Canyon actually has two sections (Upper and Lower), but it's the Upper canyon that has the famous light beams that you see in all the photos. So book far in advance if you really want to visit Upper Antelope Canyon. To get a people-free shot like this, you need to be willing to elbow your way to the front of the group! 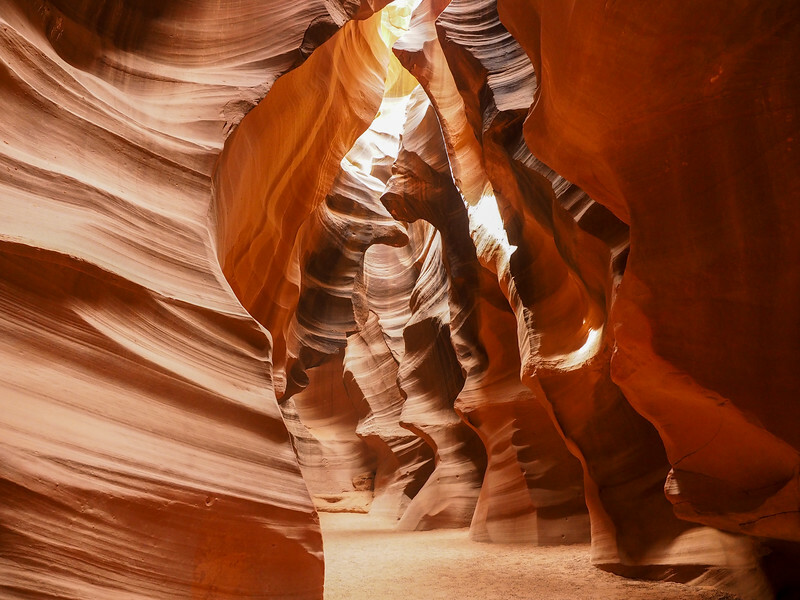 RELATED: Is Antelope Canyon Really Worth Visiting? Spoiler alert: I DO think Antelope Canyon is worth seeing, but just be aware that you'll be sharing the experience with a lot of other people. Also, shooting up is a good way to avoid getting people in your canyon shots. Where to stay: The , , and are all good bets. Where to eat: We had yummy Mexican food at El Tapatio, and good burgers at Slackers. 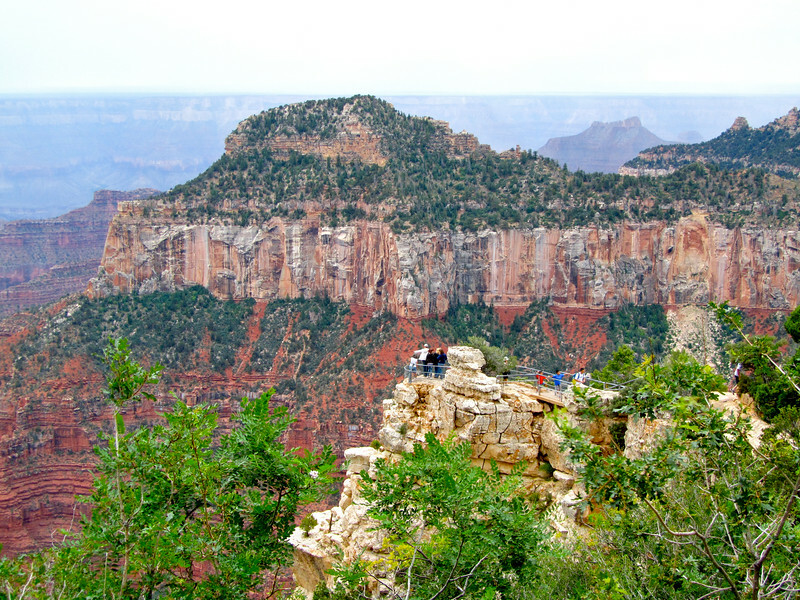 When my sister and I did a road trip in the summer of 2011, we visited the North Rim of the Grand Canyon from Page. 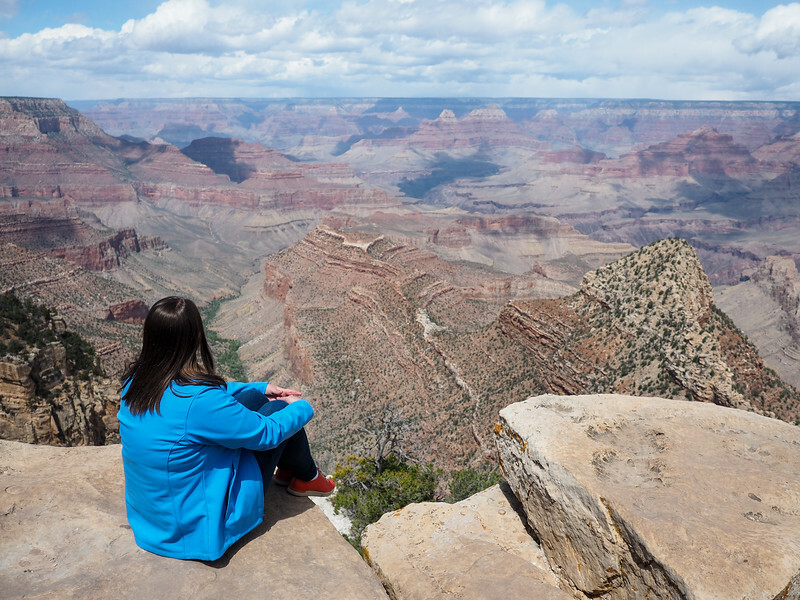 It's a much quieter experience (only 10% of visitors to the Grand Canyon visit the North Rim), but still just as epic. However, when Elliot and I did our road trip in April 2016, visiting the North Rim wasn't an option since the only road leading to this part of the Grand Canyon closes for the winter and is only open from mid-May through mid-October. For that reason, we decided to spend a day at the South Rim instead. It's actually quicker to reach the South Rim entrance to Grand Canyon National Park from Page than it is to reach the North Rim, so it worked out well for us, timing-wise. We started out at Desert View at the east entrance to the Grand Canyon (where we got caught in a blustery snow flurry! ), and made our way along Route 64, stopping at all the viewpoints on the way to Grand Canyon Village and the South Rim visitor center. After checking out the visitor center and nearby Mather Point, we hopped on one of the that travel along the South Rim. These shuttles are a great stress-free way to access trails, viewpoints, and other points of interest, some of which are only accessible by bus. We hopped on and off the Red Route bus all afternoon, visiting amazing lookouts like Maricopa Point, Mohave Point, The Abyss, Pima Point, and more. We even did a short hike between two of the shuttle stops along the Rim Trail just to get our legs working. 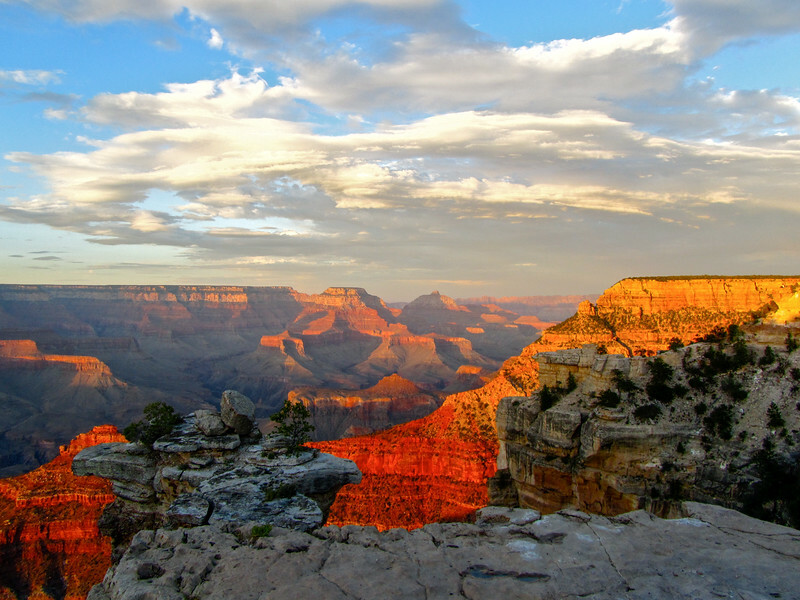 If you want to catch a great sunset at the South Rim of the Grand Canyon, Hopi Point is the most famous spot, but you can find great views at Yaki, Pima, and Yavapai Points, too. We then decided to drive to Flagstaff for the night in order to save some money on a hotel (it's NOT cheap to stay anywhere near the Grand Canyon during most of the year). Where to stay: We stayed at the in Flagstaff simply because it was affordable and convenient. If you book far enough in advance, I can also recommend the in Tusayan, which has fun things like a bowling alley on-site. Day 10 is when our Southwest adventure came to an end. The drive from Flagstaff back to Las Vegas is just under 4 hours, meaning you can easily book your flight home in the afternoon/early evening, which is what we did. Elliot and I were both sad to say goodbye to the Southwest, but I have a sneaking suspicion this might not be our last trip there. 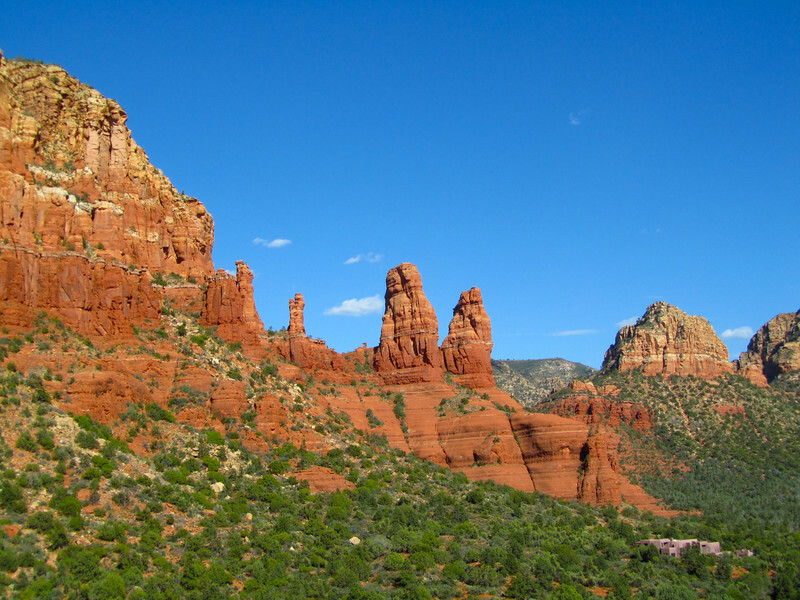 If you have an extra day or two, consider adding in a stop in Sedona, Arizona, after you visit the Grand Canyon. It's less than an hour south of Flagstaff and is a super cool town in red rock country. 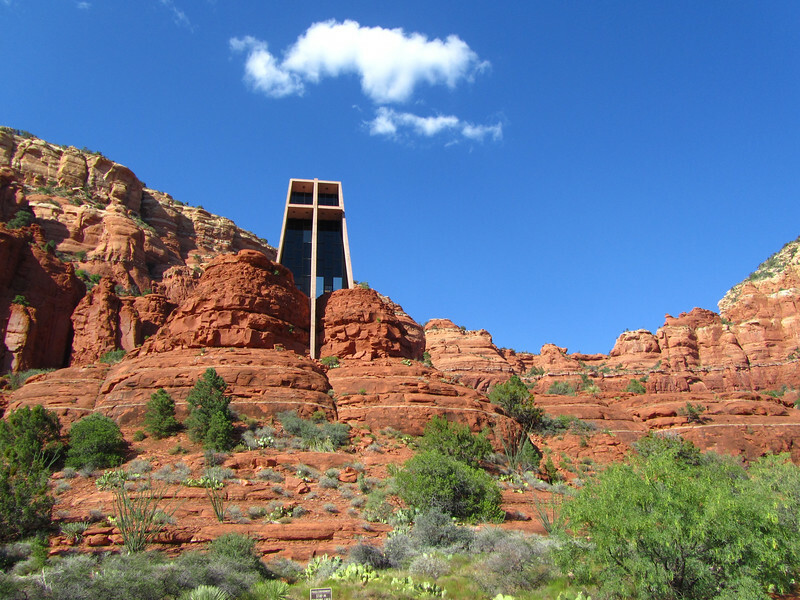 Some things to do in Sedona (especially if you visit during the warm summer months) include: taking a Sedona Trolley tour, seeing the Chapel of the Holy Cross, splashing around at Slide Rock State Park, and possibly hiking in Red Rocks State Park. In the winter, you can still do some hikes and spend time shopping around Sedona (I really like the Tlaquepaque Arts & Crafts Village). Where to stay: Check out the (mid-range), or the (luxury). Where to eat: Get a sandwich at Sedona Memories Bakery Cafe, or try some cactus fries at the Cowboy Club Grille. The Elote Cafe is also highly recommended. Want to download a printer-friendly version of this itinerary? to sign up and get your FREE printable Southwest itinerary! Check out my list of road trip tips for ALL my tricks for road tripping in the U.S.
Make sure you have extra water. Dehydration is not a joke, and can be a very real threat if you’re traveling out West during the summer. Always have extra water (pack a in your trunk! ), because you never know when you might need it. Most national parks will have water bottle filling stations, but be sure to have a reusable water bottle (I love my ) or a with you – and fill up at every opportunity. Don't forget your . For any major trip (and especially one where you’re going to be driving through unfamiliar territory), I always recommend purchasing travel insurance. If you rent a car (or drive your own), your car should be covered in case of an accident. But what about all the other things that could potentially happen to YOU? I recommend for basic (and really affordable) travel insurance – because you just never know! A , because there are long empty stretches on this road! 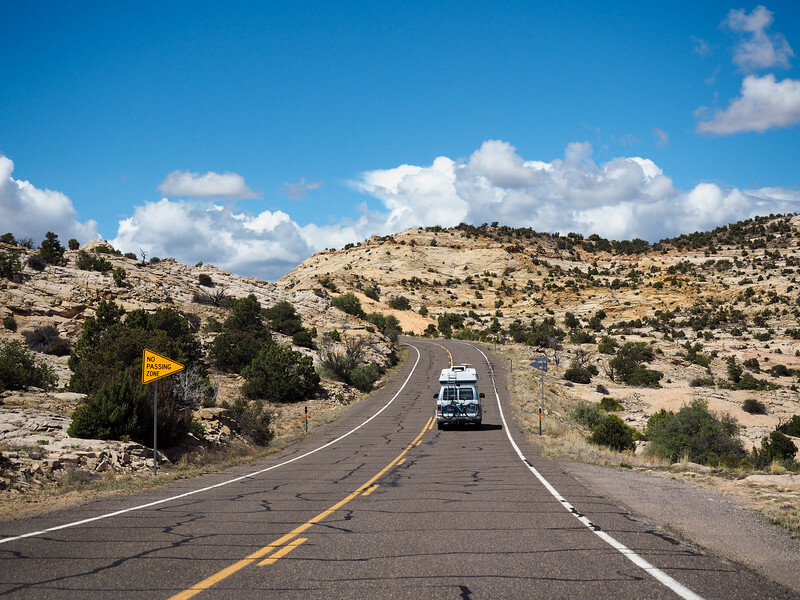 Have you ever road tripped in the American Southwest? What are your favorite stops? Ahh! This makes me want to be back in Utah! I worked there last summer on Lake Powell and will be back in April and I can’t wait! 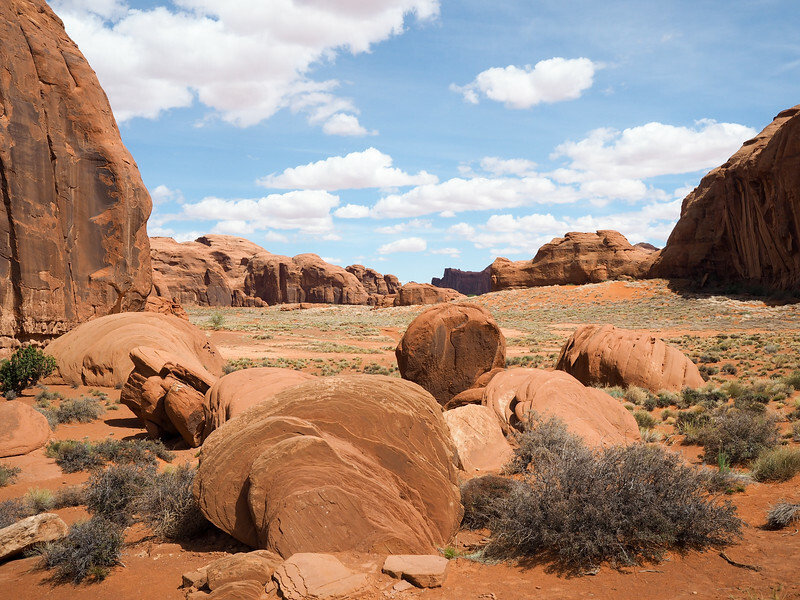 I totally agree with all of this and highly recommend Goblin Valley! It’s like a playground for grown ups. I definitely need to make it to Monument Valley this summer. I LOVE all these pictures! Sorry, rambling, I just love it all! It’s actually crazy how many NPs and how much beauty you can see in a mere ten days! I keep thinking people in the US are very lucky to be so close to so much grand scenery! I’ll bookmark this itinerary to make sure I use it when I plan a trip in the area! And it’s especially true in the Southwest – it’s chock full of amazing national parks and monuments and all-around incredible scenery!! Bookmarking this for when my husband and I plan our trip to the Southwest! This looks like the perfect combination of driving and hiking. Thanks for all the detail in this post. Gorgeous, informative post! Perfect timing, too…we are visiting some of these same spots in just two weeks and seeing your photos has me very excited. By the way, I love your “Is Antelope Canyon worth it” post. It helped us a lot in our trip planning. Thanks again! Ooo I’m jealous! I don’t think I could ever get tired of this part of the US. And I’m glad my Antelope Canyon post helped you out! What a fantastic road trip! This must have been utterly amazing. Really enjoyed reading your post, Akatuki. It was fantastic! It’s one of those trips that I still find myself thinking about all the time. 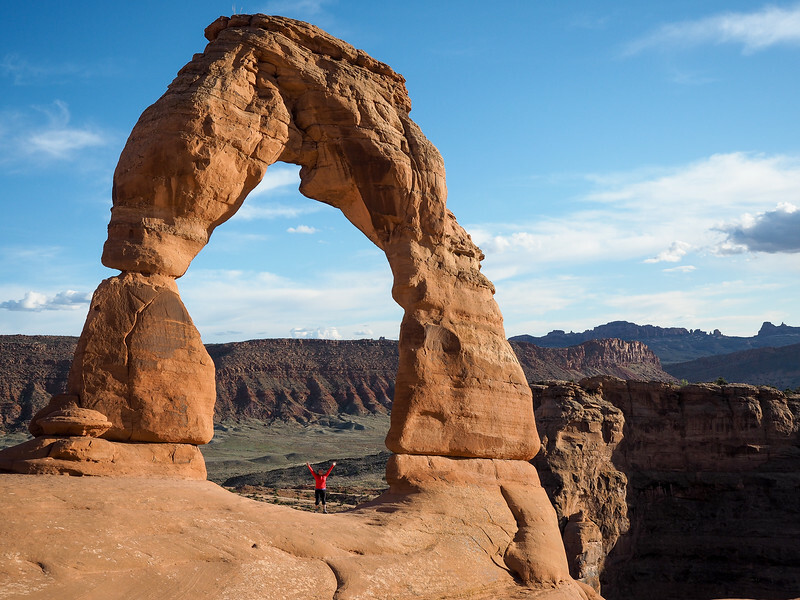 I’m lucky to live in Utah and explore these areas often – I spent last weekend in Moab at Arches and Canyonlands. I have Antelope Canyon on my short-term bucket list. This is a terrific itinerary, Akatuki! I’m definitely jealous! I mean, Ohio is still pretty cool, but Utah is just so stunning! You appeared to be on the edge of many of those rocks – wasn’t that dangerous? I mean, I suppose it could have been if my balance had been poor. 😉 I made sure I was only standing in places that seemed supported underneath – and didn’t get toooooo close to the edge! Great photos and thanks for an interesting itinerary. I never would have thought about flying into Las Vegas and using it as a starting point of a new trip. But then I always find enough in and near Vegas to keep me busy. And it appears car rental rules have relaxed. It wasn’t too long ago that customers weren’t allowed to take car rentals out of state. And that had more to do with people who lost too much money in Vegas, cashed in their plane tickets, and needed a car home. Or to sell. Oh man that’s crazy! We didn’t have an issue – and we told the guy renting our car to us where we were headed! We also returned the car in Vegas, though, so maybe that helped us avoid any issues. Great post. I live in India. My daughter lives in Portland. She and her husband traveled to almost all the places mentioned by you. And I traveled with them through their photographs. I’ve relived the journey just now through your blog. I and my wife are planning to visit USA this year. If my daughter has the stomach,and I have the stamina, maybe we’ll retravel the road. Hope you have a fantastic trip, wherever it takes you! I’ve only been to Arches (which I loved btw) but am dying to go back and do just about everything you listed here. Zion, Monument Valley, and Horseshoe Bend are all at the top of the list. And coming from the East Coast, the scenery out there looks so surreal. Agreed. It was still a must for me, too! Some of my favorite scenery in the world (no joke!). I had only been to Arches, Monument Valley, and Antelope Canyon previously, so seeing all the other parks was incredible (and I didn’t mind revisiting the places I’d already been at all either!). The USA has such beautiful sights! These are some excellent suggestions for road trips. I particularly enjoyed the Tioga Road trip through Yosemite National Park. The views on display from the window of your vehicle are simply phenomenal! It seems that the USA is the perfect place to hit the road and cruise past its wonderfully diverse landscape. These routes look fantastic, I would love to follow them and see all these sights for myself. Yosemite is definitely another gorgeous park – we have so many here in the US! I’m looking forward to exploring more later this year. Such amazing photos and that’s a good itinerary! 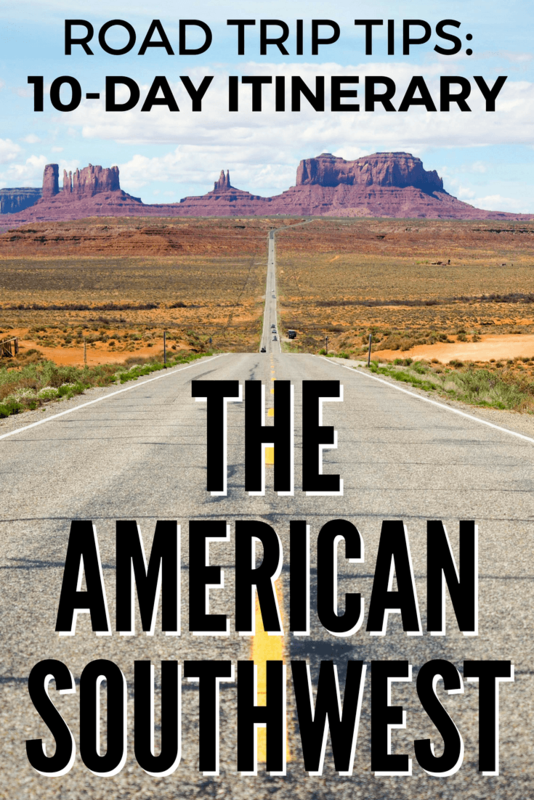 I gain good information from reading this article for when we go traveling in the southwest of america. Thanks for sharing this! Glad you found it useful, Jose! Great breakdown of a Southwest road trip! I hit many of these same spots on a 10 day trip in 2012, but started in Denver and ended in Phoenix. The Southwest has called me back a few more times since then! I’ve been twice and have no doubts I’ll be making more return trips! Great Post! I really enjoyed it! I’m planning a 6 month US road trip, so I’m glad I stumbled across this article. I had a very similar itinerary to you, but added in Monument Valley and Sedona to my route after reading about them. I also didn’t know I would need a tour to see Antelope Canyon, which is helpful. Thanks for publishing this! So happy to be able to help – and even happier to hear that you added Monument Valley to your list! It’s one of my favorite spots and I don’t think it should be missed! 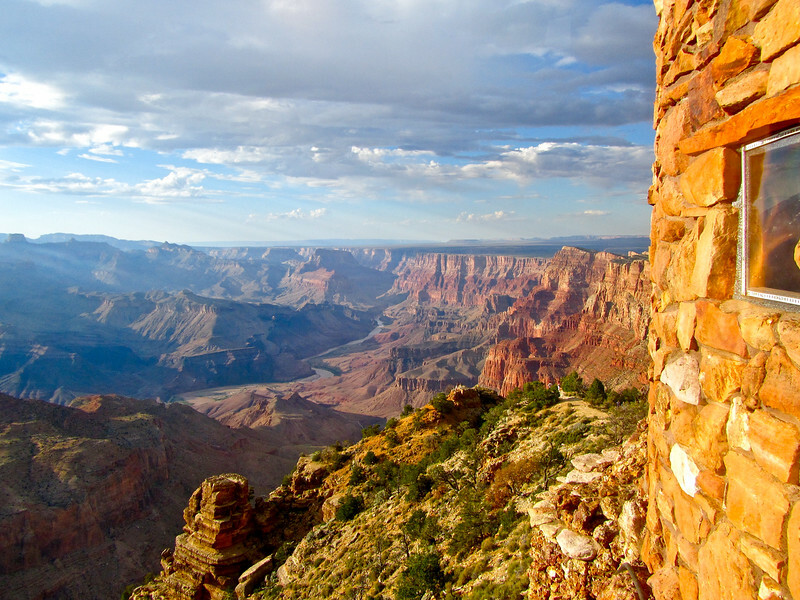 I cannot wait to get back to the SouthWest this fall – planning to hit all of these highlights, and the North Rim! That’s going to be a great trip! I totally agree with you. When visiting America, a roadtrip is the way to go! When we went to America in 2011 (and I’ve only been once), we loved it! We went to California (of course), Nevada, Utah, and Arizona. We went to 4 National Parks, Route 66, San Fransciso, Vegas, The Grand Canyon, Santa Barbara, Disneyland California. It was amazing. Sadly, we were only able to spend a month as it was January (my son was in international school at the time so you could take time off “to travel”). I’d like to go to America again. But perhaps not just now…. This is a great road trip idea! I’d always thought I wanted to do a road trip like this but hadn’t quite figured how to fit it all together, and this is a great way to do it. I worked at the Grand Canyon North Rim a couple summers ago but STILL never made it to Page and Lake Powell and stuff 🙁 And I live in Vegas so have done Zion and Bryce. But to go further north into Utah would be amazing. Thank you for this amazing itinerary. Those places and views breathtaking! Would really love to jump on a trip to the Southwest soon! I’m glad this post could sort of transport you there! These pictures are surely inviting me enough to visit this place, rock formation is so enchanting. Thanks. The Southwest has some of the best rock formations anywhere! The shuttles that you’ll find in places like Zion and the Grand Canyon are more of a hop-on, hop-off deal, so you can choose to stay in one spot as long as you want to. The other parks, though, are all accessible by your own car. Hi – This is the exact trip I am planning in October 2017. However, I’ll be going alone. Would you have made this trip alone? I must confess I’m a bit nervous about all the driving by myself. The good news is that there’s not *that* much driving to this trip – I’ve done road trips with way more driving in the past! Having said that, though, I’m not personally a huge fan of solo road trips when they are longer than a few days. But that’s just because I like having someone to chat with and share the adventure with. But you absolutely can do it solo! Thanks for getting back to me so quickly. Yes, 10 days is a long time to be alone. However I don’t see one park that I’d want to cross off that list! Unfortunately the one friend who I would consider asking isn’t fit enough to hike, and I want to do some hiking. I hate the thought of just driving through a park and not getting out of the car to experience it. I could try to cut it down to 7 days but I’d have to cut Canyonlands. Hi – sorry – I have more questions! Did you book your flights first then your rooms or the other way around? I wanted to go mid-to-late October, but am rethinking because of snowy weather. Do you think mid-to-late September will be crowded? I’m thinking 9/20 through 9/29 – in that date range. I’m trying to figure out the least expensive days of the week to fly. I’d be coming from NYC. I would book your flights first so you have confirmed dates, and then work out your itinerary and book hotels. As for dates, I think late September would be just fine! The summer months are usually the busiest, but kids will be back in school by the end of September, so you won’t have any many families traveling then. Hello Anita, I, my wife and our good friend are planning this exact trip for the beginning of Oct. We are retiree’s. The more the merrier, want to join in? We are from NW Pa. If you think you might, email me for further discussion. longbikez-at-gmail-dot-com. America. I remember my trip to Lonavala about a year back when I was in India. We had taken a bike on rent in Mumbai from this company called www[dot]wheelstreet[dot]com. I want to know, if there are similar bike rental places in America as well, as I am looking forward to taking this trip on two wheels. And also, is it advisable to do so? Nice! There are definitely lots of options when it comes to the Southwest! Great post. We are considering doing this but with a rented SMALL RV. What do you think? Thank you. Should be fine. There are lots of people driving RVs out in that part of the US. Love the itinerary. My wife and I are thinking about doing something similar this December just before our Christmas break. Do you think it’ll be too cold for the hikes? Or will any of the parks be closed for the winter? Hey Sam! 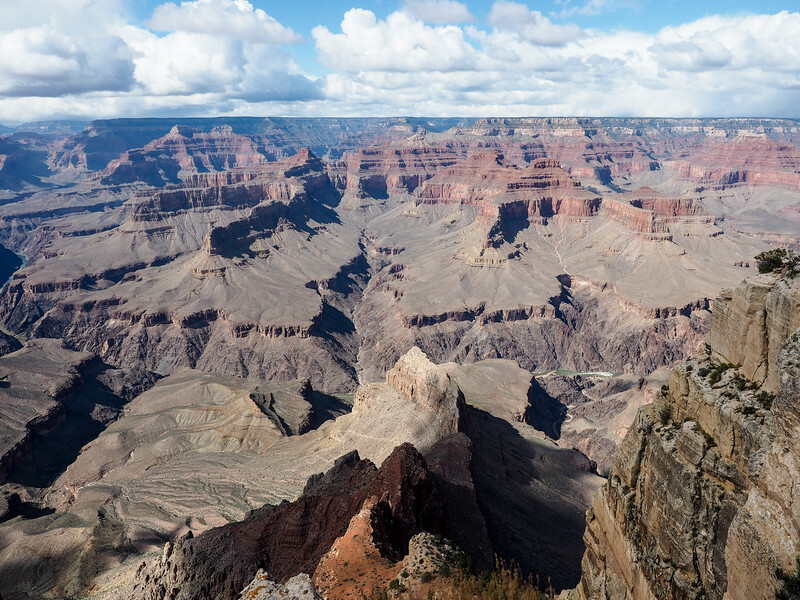 The only park that closes for the whole winter is the North Rim of the Grand Canyon. The rest of the parks are open year-round, and they usually do keep the roads maintained. For the hikes, it totally depends. All of these parks do get snow in the winter, and it can get quite cold. If a park get a lot of snow, the trails obviously will be covered and potentially icy, too. I would be sure to bring good gear (including possibly traction devices like Yaxtrax and maybe even hiking poles) if you plan to do a lot of hiking. I would also check at each visitor center for trail conditions, so you know what to expect. Love this post, Akatuki, especially the tips at the end re: water, travel insurance and the America The Beautiful Pass. I write for a couple of tourism-related sites in Page, AZ and would love to link to this post if it’s OK with you. If not, I totally understand. Check them out if/when you get a minute. Very nice trip, I came here three times (from France)….amazing places. Yes for sure! 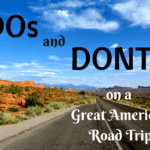 I did a Route 66 road trip a few years ago and loved that as well! Always happy to provide info like this! Wow, your photos are gorgeous. I live in Las Vegas and you did an outstanding job of showing the beauty of the southwest in pictures. Thanks so much for your helpful information! Luckily it’s not difficult to show the beauty of this part of the US – it’s so amazing! Following this itinerary, it was just under 1300 miles! We followed your guide for an end of Sept/Early Oct. visit and had a great time! The only thing I would mention is that tours to Antelope now book over 6 months in advance. We were faced with all tours being sold out trying for 3 months. We were fortunate in keeping trying after arrival and found one tour at 4pm where a whole busload had cancelled and considered ourselves very lucky to get in at all. The only other thing I might mention is the severe overcrowding in GC, you might consider catching the free bus outside the park (purple) and not even trying to drive through. Although the bus was SRO we found it less stressful than dealing with the traffic. Wow 6 months out?! That’s insane! I blame Instagram. Haha. Last year we were still able to get tour spots about a month beforehand. I’ll make a note that it’s even tougher now! Awesome post, Akatuki. Love your blog, it’s #1 on my list of travel blogs to read, and believe me there are dozens of blogs on my list. I never get to half of them, but always get to yours! I have a question about the inconic photo that is heading your post. The long straight road. Where exactly is this taken? My brother and his family will be visiting from the UK in the Spring and I’d love to take them to drive that road. It’s so iconic. That specific road is U.S. Highway 163, just before you get to Monument Valley (coming from the north). It’s definitely very iconic! Hi! I loved this post. this looks like a perfect road trip and I cant wait to go on this trip. Question: Is it better to do this clockwise or counter clockwise. I am thinking of whether sun will be behind us if we go counter clockwise. How about sunrise or sunset destinations in this trip, would clockwise or counter clockwise be better? Thanking you for this wonderful blog. Our recent 9 day trip to Utah was primarily based on this with small changes. It all worked out fine and the weather too cooperated. Keep up the good work , I sure enjoy your travel blogs. Thanks so much for letting me know! I’m glad you had a great trip! Great post! You’ve inspired us to take a trip out west in the spring ?. As far as the Upper Antelope Canyon tours, are there multiple tour companies? Is there a specific tour company you can recommend? Thanks! Hey Mark! That’s awesome! As for Upper Antelope Canyon tours, yes there are a couple different companies, but they all offer basically the same tour. The first time I went, I went with Antelope Canyon Navajo Tours (we just drove to the canyon ourselves and joined the next available tour, though this is tougher to do now since it’s so popular!). And on my last trip, we went with Antelope Slot Canyon Tours (formerly Chief Tsosie’s). Hi Akatuki! Could you please tell me how many days you spent in each city? Trying to do my itinerary for a road trip in September. You blog is Amazing!!! Help me a lot with this post!!! Thank you for all tips! Very excited for my road trip! Thanks for all the good tips and pictures. We’ve been wanting to take this road trip, but didn’t know how to start researching it. Excellent trip – nicely detailed. Happy to use accomodation etc recommended by you. We are a an averagely fit 62 year old couple from New Zealand but will be doing this trip in mid Dec this year as attending a Conf in Vegas prior. Will this itineary still work ?? Any red flags or changes you recommend. We already have an Annual Pass as bought it 2 months ago while we took a holiday in Yellow Stone ! Hey Kamal! This itinerary should be do-able in December, but just note that you might run into snow in some of the higher-elevation parks. I don’t know if any of the hiking trails close because of snow, but you should be able to check with a Ranger at the visitor centers. Just make sure to pack some warm layers! Will report back after the trip. We have booked Mawsik Lodge for 2 nights at GC and also extending to Sedona for another 2-3 days prior to return to Vegas. Are there any special accomodation or tours we need to book at this time of the year as it should not be too busy I think. This time of year you shouldn’t have too many issues – though it never hurts to check on hotel availability, just to be safe. So excited I read this, planning for my family next summer, thanks! Thx a lot for this great discription of your perfect road trip. It helps me a lot, as I just book our flights for June 2019 and i’m starting to plan our road trip, which should contain all spots you mentioned. As we have 14 nights, we are very lucky to be able to spend a little more time. So we probably will stay the first night in Vegas to handle the jet-lag and see the city although it should be very crowded at weekends. If you have any other recommendations I would be very happy to hear from you. Hi Frank! If you have more time, then I definitely recommend spending some extra time in some of these places. You could easily devote more time to pretty much all the national parks! I would LOVE to do this one day. I’ve done pieces, but have never really given myself enough time to stop and enjoy all the route really has to offer. Pinned for later so I can steal your itinerary 😉 Thank you! Haha feel free to steal away! It’s an amazing part of the US, and everyone should take time to explore it! 5 of us took off from Las Vegas on June 10 and, with a few variations, mimicked your entire trip. Thank you for this post!! That’s great to hear! I’m so glad to know that people are finding this itinerary so helpful! This is like, the exact road trip that my husband and I want to do some day! We really want to rent a car with a roof-top tent on it and camp around the National Parks as well! 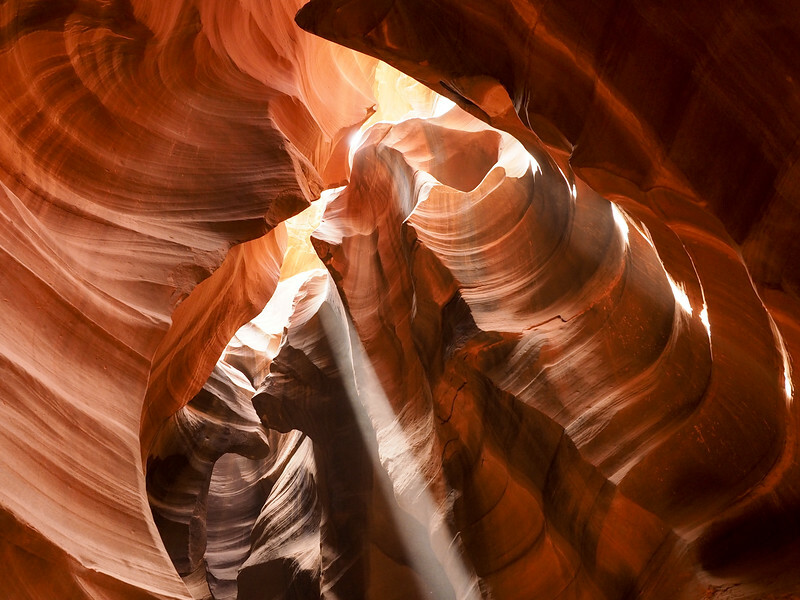 Good to know about the tours of Antelope Canyon! We’ll have to remember that when we finally make the plans to go! That would be super fun! It’s an amazing part of the country to road trip! It was my dream road trip, too, and it certainly did not disappoint! Wooowww your pics are absolutely stunning. Antelope Canyon was my favourite. Thanks for sharing. Thank you! Antelope Canyon is incredible for photos! Great blog with pictures! Planning a trip for next April but only have 6/7 days. What would you recommend for an itinerary? Would love to see all of the above, but timing won’t allow. We also have kids so am a bit worried that they’ll go crazy being in the car for long drives. Thanks! If you’re shorter on time, I would maybe just focus on either Utah or Arizona. You could do 6 days in Zion, Bryce, and that part of Utah. Or you could fly into Arizona and visit the Grand Canyon and the stuff around Page. Either option would mean less driving time, and more time to fully explore each place! 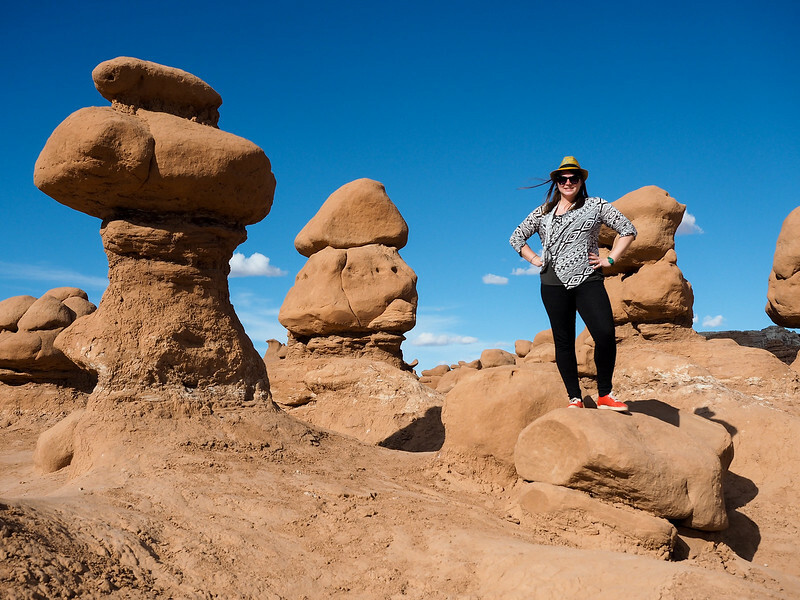 This is probably the best blog post about a Southwest road trip I have yet to see! Thank you so much for all the great tips and details. My husband and I are going next April! Can’t wait! Thanks, Bonnie! I’m so happy to hear you’ve found it helpful! I printed out your itinerary for a road trip with my son and it was so helpful!!!! Thank you so much for taking the time to post this valuable information. It was a trip of a lifetime!! That’s great to hear, Lisa! This is an amazing article. I’ve done maybe half of these and agree with everything you’re saying and suggesting about those so I’ll definitely be following your suggestions for the others. Thanks for writing such a detailed, photo-ful, linked itinerary. It’s amazing. We did our trip recently, the big add from your post was Upper Antelope. That was absolutely incredible. Thanks for your post. Looking forward to hitting more of them later. So glad to hear it was great! The Southwest really is amazing. It gets pretty crowded in the summer – but the number of people is regulated by the fact that you have to book a guided tour. Lower Antelope will be less busy, but you can only see the light beams at Upper Antelope around midday. I don’t know that it can get crowded as there’s three companies and they schedule it very well (and it can sell out – get your tickets a few days before at least). I was impressed with how often we were alone in different “rooms” or parts of the canyon. The different tour groups carefully manage that. There’s a little cross over going room to room but then you’re alone with the 8 other people in the tour, taking photos, etc. We went with Adventurous Antelope Canyon Tours and were very happy but everyone on other tours seemed happy too. Can’t speak about Lower Antelope but Upper was absolutely mind-blowing. Oh, we must have been replying at the same time. My comment is in no way disagreeing with Akatuki who I would defer to on all info about this area. We were there in April but every tour was sold out so I assumed that was indicative of how busy it could get. Thank you for this awesome detailed post! I would love to do this with my family. They have spring break for 10 days starting March 8th. With you having snow in April…I wonder if this is not a good time to visit. The kids really want to go to four corners. Could you suggest where we couod possibly shave a day to allow for it? It would still be chilly in the parks and towns at higher elevations in March. But this itinerary is doable year-round! As for the Four Corners… it’s kind of in the middle of nowhere. You could maybe skip Page if you wanted to squeeze it in between Arches and the Grand Canyon – but to be honest I’ve heard it’s not that exciting! Thank you for this!!! I’m planing my trip for May 10 days exactly. I love everything about this plan! I kew the places I want to visit, but I didn’t know where to started. This article also show me new places. Thank you, thank you! This is great information Akatuki! We are planning a family Southwest RV trip for next summer. I do have some concerns about certain parks not allowing RVs (Monument Valley being one of them). Do you know of any other parks that do allow RVs to enter the park? I don’t know of any other parks that prohibit RVs. 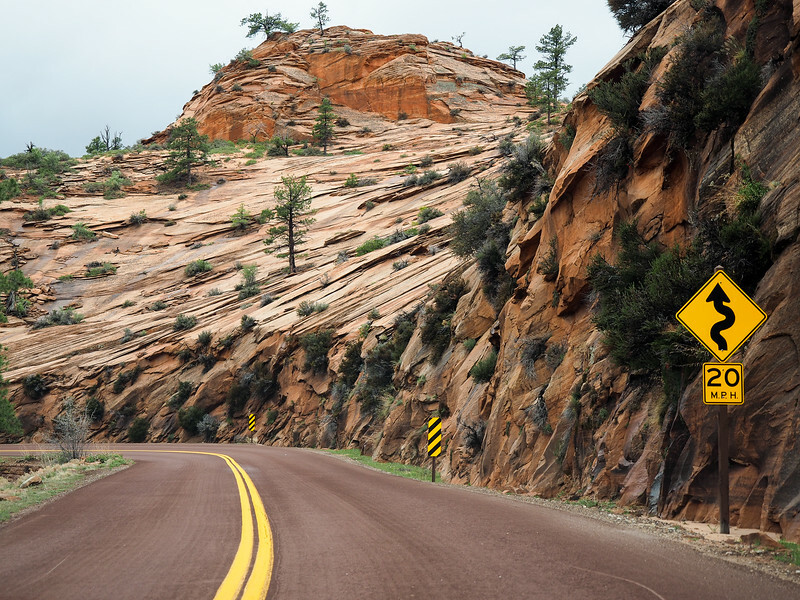 Obviously if you go in summer you won’t be able to drive into Zion Canyon – but no one can drive inside there in the summer. 🙂 I think there’s an extra fee attached for some of the tunnels near Zion for larger vehicles, but that’s the only thing I can think of! I came across this site about a year ago and have planned our itinerary almost identical to this. Great information. We’ll be in Bryce the first week of April. It’s shame they’ve had so much snow in Bryce this winter, currently all the trails are closed and the scenic drive is closed beyond mile marker 3 and won’t re-open until some point in April, so it doesn’t look like we’ll be able to drive the remaining 15 miles out to Rainbow Point. Do you know if there are still any good observation points on the first 3 miles of scenic drive? Thanks. Hey Dean! Yes! Viewpoints before mile marker 3 include Sunrise Point, Sunset Point, and Inspiration Point. 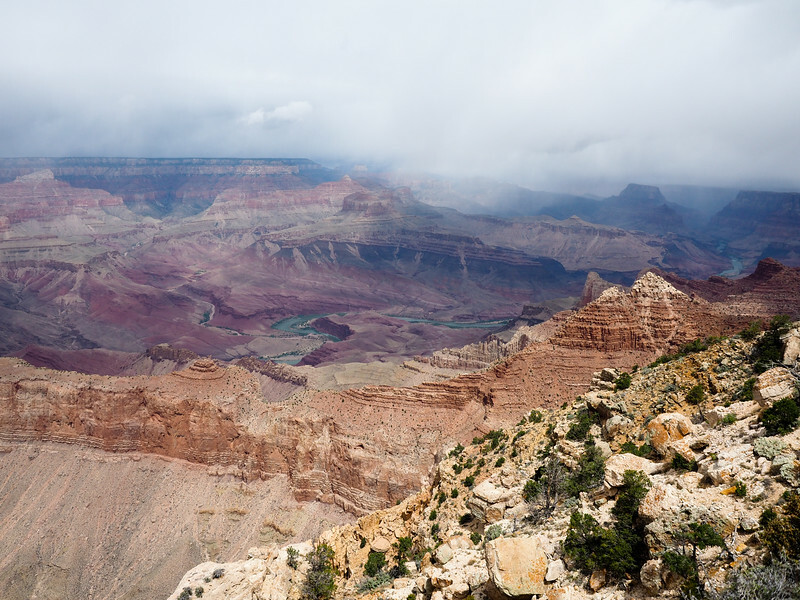 According to the NPS website, the Rim Trail is open up to Inspiration Point, so you could still do a walk along it, too. Thanks Akatuki, the photos of those viewpoints look awesome! We just returned from our 2 week road trip. A fantastic adventure. Every place we visited was unique and the drive through Grand Staircase-Escalante was epic. We did Sedona too. Thanks again for this itinerary. Happy to hear you loved it! Would love to get your thoughts and opinions on our itinerary rough draft we came up with for our upcoming (July) trip to the Southwest. This will be our first time and we will be traveling with our very adventurous 9 & 10 year old boys. We have a full 2 weeks so we basically took your 10 day trip, flipped it backwards and expanded a little. We are starting in Phoenix and ending in Las Vegas. Because we are inexperienced with traveling out west we would love any input you may have. Because of the ages of our boys we would probably limit hikes to no more than 5-6 miles/daily (possibly a little more if broken up). We tried to leave a little time during our trip to do a little fishing and the boys wanted to get a little disc golf in if possible. Please let me know the best way to share our itinerary with you. Great! Thanks, I sent it to you this morning. Looking forward to hearing what you think.